Past guests of Uniworld, Trafalgar, CostSaver, Insight, Luxury Gold, African Travel, Brendan and Contiki save an additional $100 per person off this trip. Click here for eligible departures. Arrive at Brussels International Airport. If your cruise package includes a group arrival transfer or if you have purchased a private arrival transfer, you will be greeted by a Uniworld representative and transferred to the ship. Enjoy an exclusive “Morning with the Masters” visit to the Hermitage Amsterdam, the museum that is home of the sensational “Portrait Gallery of the Golden Age” exhibition. You’ll have the chance to see thirty massive 17th-century group portraits from impressive collections normally on display at the Amsterdam Museum and the Rijksmuseum–all under the same roof for the very first time. The thirty life-size portraits depict the lives of Dutch citizens in their respective cities. These “brothers and sisters” of the Night Watch are extremely unique and rarely seen due to their large size. Together, the portraits illustrate the collective citizenship that is typical of The Netherlands. Would you like to know why the Dutch attach so much importance to freedom and equality? Your answer hangs on the walls—in life-size form—at the Hermitage Amsterdam. Wander through the picture-perfect villages of Veere, Hoorn and Enkhuizen, and the enchanting outdoor Zuiderzee Museum. Take in the dazzling skyline of Rotterdam as you cruise through the bustling harbor and drift along the canals of Bruges. 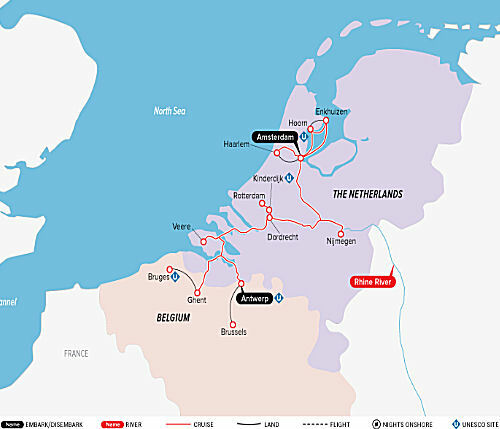 All along the way, you’ll savor Dutch delights and Belgian treats as you sail the aquatic highways and byways of two amazing countries shaped by water. Who will enjoy this cruise? Those who wish to step back in time may visit historic villages and medieval city centers. Art lovers will enjoy guided museum visits, while garden lovers will find a host of wonders with springtime blossoms. Prices exclude additional port charges of $250 per person.